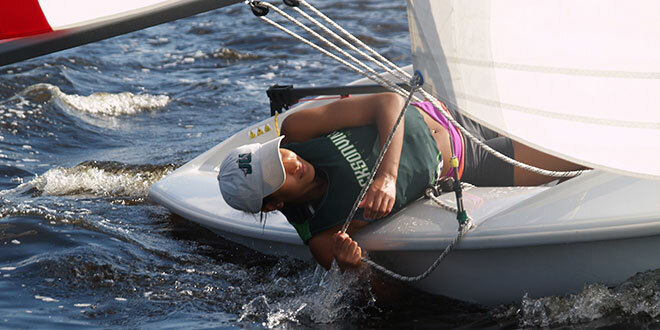 Once again, the Jacksonville University Sailing Team made it into the College Sailing National Championship, one of only 36 college teams to qualify out of 250 nationally. That’s an impressive two bids to the marquee event in only three years’ existence as a collegiate varsity sailing team. After finishing fourth in its conference in 2014 and competing in nationals for the first time, the sailing team hit the waters with high hopes for this year’s season. Returning sailors Danny Lawless and Hannah Knighton (sophomores) got off to a great start May 2 during the South Atlantic Inter-Collegiate Sailing Association (SAISA) Spring Coed Conference Championship at the College of Charleston, finishing fourth in the A Division to open the regatta. It was a continuing battle for the sailing team during the regatta, and many times it looked as if it would not be victorious. However, thanks to hard work and perseverance, the team performed well, going up against College of Charleston, which won the event, as well as South Florida, Eckerd College, Florida, Clemson, UNCW, New College of Florida, NC State, Georgia Tech and Rollins College.